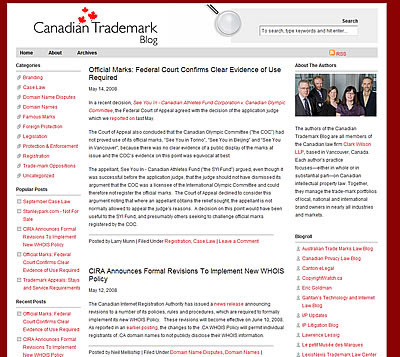 Congrats to the crew over at Clark Wilson LLP's Canadian Trademark Blog on their new blog design. If you're reading via the RSS feed, be sure to click through today and check out the new look! Also, congratulations to CW's in-house Webmaster, and multi-functional Library Technician Rob Golbeck who was front and centre on this project. Way to demonstrate the techie-prowess on this one Rob! In case anyone was wondering whether law firms were the only type of organization who's culture can promote information hoarding, it seems that school teachers are just as culpable. Think about it. This means your children's teachers may be putting paycheques ahead of their clients - i.e. your kids. As a parent, that doesn't make me too happy, and I have to think there's an analogy here to how law firm clients feel... No one wants to be on the other side of the non-sharing equation, do they? Not too many Librarians or KM practitioners will ever say that sharing knowledge is a completely natural behaviour. Heck, we need to teach our kids to share! And from recent experience with a two year old, I can say... they're not too crazy on the concept. BUT, sharing is definitely a sign of a healthy & productive business. Firm clients want your best effort, and without paying to reinvent the wheel because the guy down the hall won't show you what's on his hard drive. It may take strong firm leadership to instill a sharing culture, but it is a must be done. Client relations, internal productivity, a nice place to work... If internal productivity goals are important to a firm at all, then I'd say it's time to fight instincts, and kick some bad habits. For those tracking blogs on the legal KM front, I'd like to give a strong endorsement for Mary Abraham's Above and Beyond KM. It's only been running for a couple months now, but it's well written and insightful. What I like about this blog is that it focuses on process & people rather than technology. And when technology is addressed, the underlying aspects of change management & practicality seem to prevail. Always important in a law firm setting, IMO. Do check it out. Mary's RSS feed is here. An interesting development I just posted over on Slaw ... CanLII news items seem to now be driven via their new blog! And for those so inclined, there's an RSS feed also available. DB: Think about it. This is the chance to have a voice in designing how you interact with the BC Courthouse Library. Wikis? Blogs? Collaborative spaces? RSS feeds that deliver content tailored to recent developments in your area of practice or interest? The ability to create secure web spaces to collaborate and organize research in developing areas of the law? The ability to be a part of a virtual community of lawyers who exchange ideas on certain areas of the law that are of interest to them? Consider the ability to hold on-line discussion groups around emerging topics….or incorporate knowledge management concepts into their website. What is the best way to facilitate professional development right across the Province, using virtual tools and techniques and how can the Library Society lead that change? Literally the only limits to the possibilities are the imaginations of the lawyers out there! Go read the entire post. Support like this goes a long ways with law librarians everywhere. Go Dave! And don't forget to check out the constantly updated stream of legislative changes on BCLegislation.ca! Come and take part in this great event to promote Access to Justice in an earth-friendly way! This inaugural event includes a symbolic ride from the Vancouver Public Library – Main Branch to the Southwest corner of the Law Courts. All proceeds to benefit Western Canada Society to Access Justice initiatives. Further information & Pledge sheets are available on the event notice page.